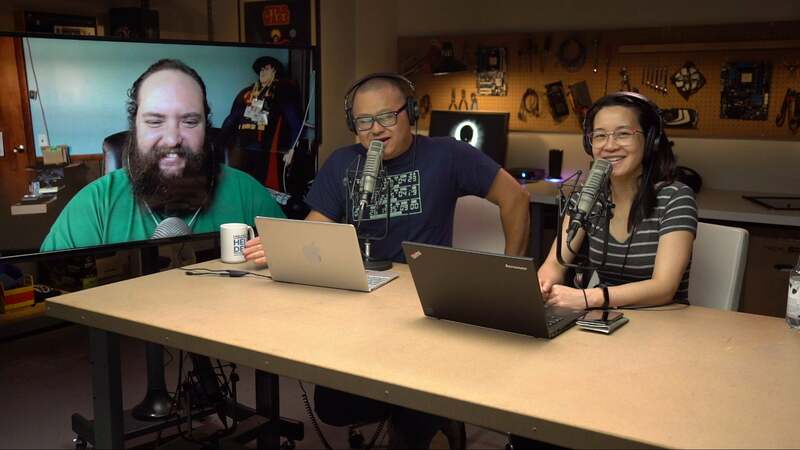 Updated July 5, 2017: PCWorld's CPU hounds debate Core i9 vs. Threadripper on our "Full Nerd" show. Will the 18-max cores in Core i9 prevail over the 16-max cores in AMD Ryzen (specifically, Threadripper)? Watch them dish it out! With Core i9, the Intel vs. AMD battle rages anew. Announced Tuesday at Computex in Taipei, Intel’s answer to AMD’s 16-core, 32-thread Threadripper is an 18-core, 36-thread monster microprocessor of its own, tailor-made for elite PC enthusiasts. The Core i9 Extreme Edition i9-7980XE, what Intel calls the first teraflop desktop PC processor ever, will be priced at (gulp!) $1,999 when it ships later this year. In a slightly lower tier will be the meat of the Core i9 family: Core i9 X-series chips in 16-core, 14-core, 12-core, and 10-core versions, with prices climbing from $999 to $1,699. All of these new Skylake-based parts will offer improvements over their older Broadwell-E counterparts: 15 percent faster in single-threaded apps and 10 percent faster in multithreaded tasks, Intel says. 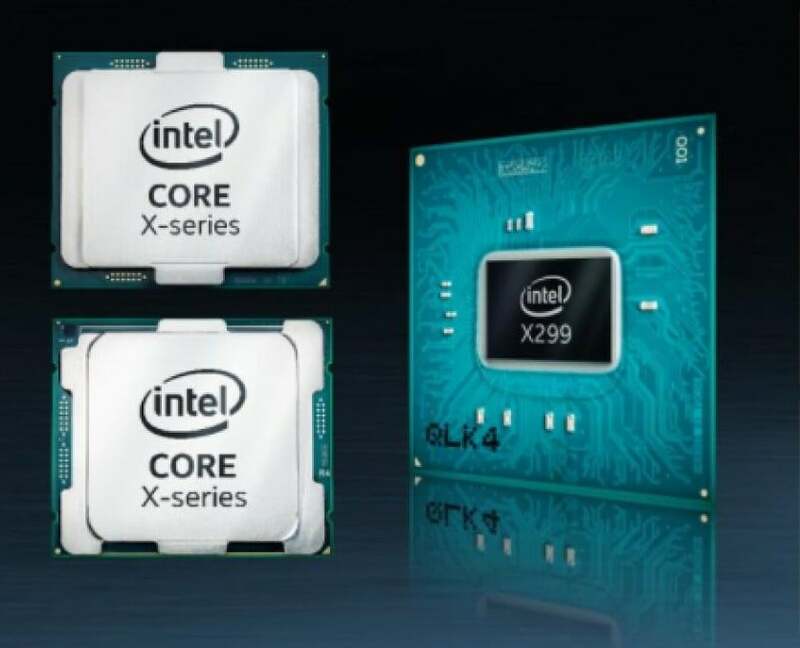 If these Core i9 X-series chips—code-named “Basin Falls”—are too rich for your blood, Intel also introduced three new Core i7 X-series chips, priced from $339 to $599, and a $242 quad-core Core i5. All of the new chips are due “in the coming weeks,” Intel said. 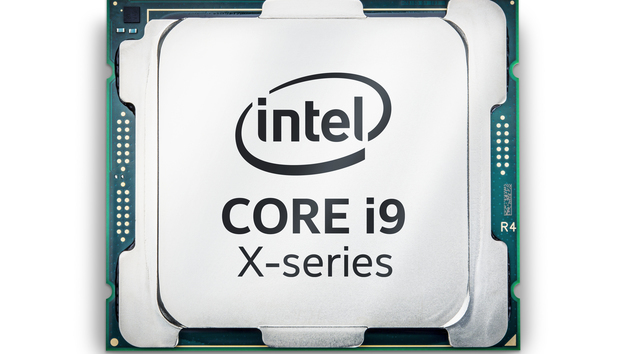 Adding the Core i9 Extreme Edition and the Core i9 X-series fills out Intel’s high-end processor lineup. 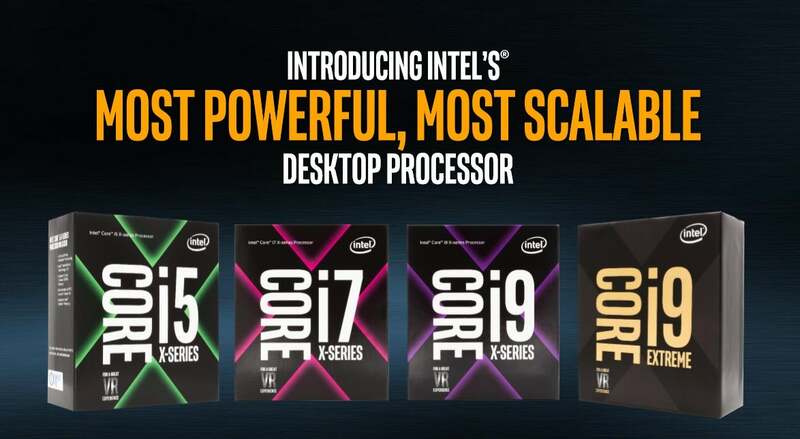 Most of the Core i9 chips will incorporate what Intel calls an updated Intel Turbo Boost Max Technology 3.0, a feature where the chip identifies not just one, but two cores as the “best” cores, and makes them available to be dynamically overclocked to higher speeds when needed. They’ll be Optane-ready, too, with over 130 Optane-ready motherboards waiting in the wings, Intel said. If there’s a catch, it’s that all of the new 165W, 140W, and 112W chips are designed around the new Socket R4. This 2,066-pin LGA socket is compatible with just one Intel chipset, the new X299, though many X299 motherboards are already being announced. Intel and AMD have a real fight going again, and we’ll have to wait and see who’ll end up on top. With Core i9, Intel’s just staked an aggressive claim to the high end of the market. AMD will now be forced to disclose the 14, 12, and 10-core versions of its Threadripper parts, as well as their prices. Intel’s laid down its cards, but the hand has yet to be played. Intel’s disclosure of the new Core i9 chips may be one of the most significant announcements this week at Computex, the Taipei-based trade show that has quietly evolved into a celebration of all things PC. But you can expect much more from Intel, too, including this bombshell: Intel executives will reveal that its next 10nm chip, Cannon Lake, will deliver 30 percent greater performance than the current Kaby Lake chips, a spokeswoman said. Intel also revealed more details about a wireless link to the HTC Vive VR headset using its WiGig technology. The initial HTC-Intel partnership was announced this past January, at CES. Among the big Core i9 news, Intel also announced availability of its Compute Card, a credit card-sized mini PC that slides into displays, digital whiteboards, and quasi-notebook devices. As clock speeds have plateaued at slightly above 4GHz, the challenge has been to find a use for all of the additional cores silicon manufacturers are building into their chips. As we’ve pointed out previously, many games still rely heavily on a single processor core. Intel has turned its attention to a new generation of “streamers” who not only use cores to play the game, but ask other cores within the system to encode the stream to Twitch or YouTube, and perhaps play some music in the background. Intel calls all of these simultaneous activities “megatasking” and sees it as a fantastic way to maintain the demand for ever-greater numbers of cores. “Even gamers are becoming content creators,” Tony Vera, the X-series marketing manager, told reporters. All of the new chips are based upon what Intel calls “Skylake-X,” except the i7-7740X, which is designed around the Kaby Lake core. One of the more interesting features of the new chips is what Intel calls an updated Turbo Boost Max Technology 3.0. (They apparently ran out of adjectives to describe it.) As Gordon Mah Ung showed in his review of Intel’s Broadwell-E chips, Turbo Boost Max Technology 3.0 identified one “best core” among all of the available models, varying from chip to chip. The chip could then bind CPU-intensive single-threaded applications to that one core, improving the overall performance. The updated version of Turbo Boost Max Technology 3.0 identifies two “best cores,” and again assigns the most CPU-intensive threads to them. It’s a nod to games and applications that are better at taking advantage of more cores. Not every chip incorporates the new feature, though, including the new six-core and the two quad-core X-series chips. Here’s Intel’s summary of (some of the) new speeds and feeds, below. Intel still hasn’t provided all of the details for all of its new chips, but here’s the latest, official word. 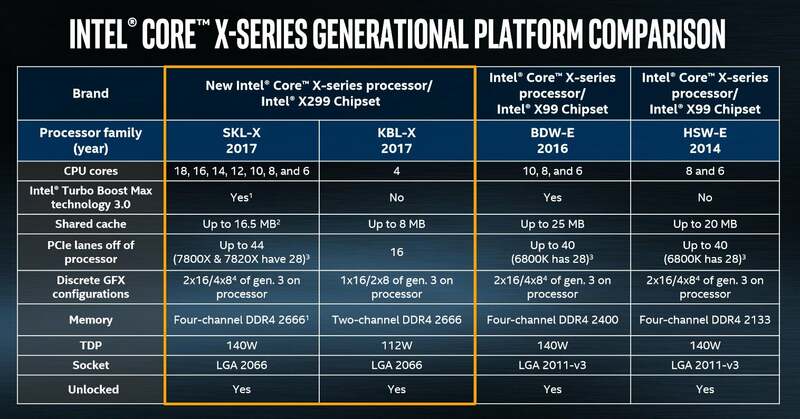 Not surprisingly, Intel’s not recommending that the new X-series parts be air-cooled. 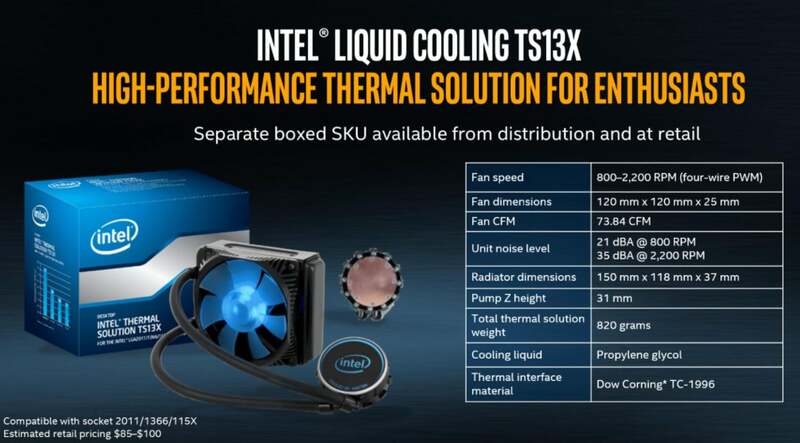 Instead, the company will sell the TS13X cooler, designed for the 165 watts and 140 watts of thermal design power heat the new chips will dissipate. Intel recommends liquid cooling for its Core i9 parts. The TS13X uses propylene glycol to pump the heat to a 73.84-CFM fan that generates between 21 and 35 dBA, spinning between 800- and 2,200rpm. The TS13X, priced at between $85 to $100, will ship separately, Intel executives said. Otherwise, Intel will maintain support for per-core overclocking and per-core voltage adjustments, using its Intel Extreme Tuning Utility (XTU). New controllable features include AVX 512 ratio offsets, trim voltage control of the memory control, and PEG/DMI overclocking. Intel will also offer its “performance tuning protection plan,” a sort of insurance policy for overclockers. The company will let you fry your chip once, just once, and get a single replacement. After that, you’re on your own. With all of the teraflop of computational horsepower at its disposal, being able to send and receive data to other parts of the system was a priority. The X299 chipset effectively doubles the bandwidth connection to the SATA 3.0 ports and USB ports by moving to Intel’s latest DMI 3.0. X299 features up to eight SATA 3.0 ports, and increases the USB 3.0 ports to ten, compared with the six ports its predecessor, the X99 chipset, used. Here’s what differentiates Intel’s new X299 chipset from its older rivals. Note that you’ll see a performance difference based on the chip architecture, too. The X299 chipset also provides up to 24 PCI Express 3.0 lanes vs. the eight PCIe lanes of Broadwell-E’s X99 chipset. Additional PCIe for such things as high-speed PCIe NVMe drives can also be plumbed directly into the PCIe coming from the CPU itself. On CPUs with 10-cores and up, a full 44 lanes of PCIe 3.0 lanes are available for use. The X299 supports faster DDR4-2066 memory, though it’s not clear how much. Intel also tweaked its cache hierarchy, an in-the-weeds adjustment that apparently reduces the overall size of the cache, in favor of putting more near the individual processors. Intel says its new cache shows a higher “hit” rate, which means Intel was probably able to cut the size of the chip but maintain its cache performance. It’s all something to get excited about, whether you’re a potential Core i9 or Core i7 X-series buyer. We’re likely to see motherboard makers and PC makers alike jump on the Core i9 bandwagon, if nothing else but to bring in more of those premium gamer dollars. We’ll keep our eyes peeled for these, and more, this week at Computex.